Sitting atop the 40th floor of EAST, Miami, a lifestyle hotel & residences at Brickell City Centre, Sugar rooftop bar + garden has recently been nominated as the #1 spot in Conde Nast Traveler’s 2017 List of “The 10 Best Rooftop Bar’s in the U.S.” for a second year in a row. Additionally, Sugar has just appointed Ped Phommavong, also known as “Chef Ped,” as Chef de Cuisine, who in this new role will add unique culinary creations inspired by Southeast Asia to the menu. 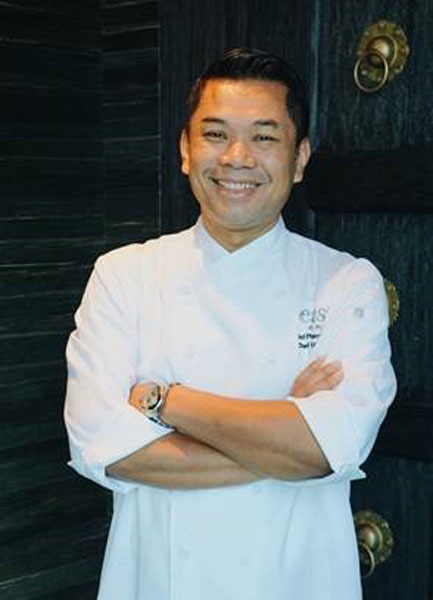 Overseeing the culinary concept and menu direction, Chef Ped says his inspiration comes from his family’s treasured recipes and the authentic tastes of Thailand. Chef Ped, who grew up in the restaurant business near the Laotian border, worked in some of the best restaurants in Bangkok before moving to the United States. Having won Iron Chef Thailand an incredible 18 times, he noted that he is excited by the energy and concept of Sugar and said he looks forward to working his culinary magic in the Magic City. Chef Ped has already added a few new savory dishes to Sugar’s menu, including Sashimi served on Pink Salt, Beijing Salmon and the Bangkok Spring Roll. Other signature menu items include, Boneless Korean Chicken Wings with sesame and peanuts; Grilled Prawns with Balinese spices and green mango sambal; Tuna Tartare on Rice Krupuc with Thai chili, jicama, lime; and for dessert, Coconut Pandan Leaf Crepe with fresh Florida mangoes, lime zest and palm sugar. Sugar’s innovative bar menu features several types of curated cocktails, as well as a diverse selection of craft beers, sake and wines from around the world, available either by the glass or by the bottle. Highlights from the drink menu include the signature Lychee Blossom, with vodka, sake, and lychee; along with the EAST of Miami, with plymouth gin, green tea, ginger, lime; and The Getaway, with plantation pineapple rum, tamarind ginger chutney, ginger beer, lime. Local beers on the menu include selections from J. Wakefield and Wynwood Brewing Company, both out of Wynwood, and Funky Buddha, a Fort Lauderdale-based craft brewery. Serving as one of two signature outlets at EAST, Miami, Sugar is more than just a bar. Designed by Los Angeles-based Studio Collective, its built upon two levels with hidden nooks and quiet spaces to escape. Guests will find themselves pulled toward views of Miami from 40 stories up, while passing through a lush corridor of trees. At the center of Sugar, a Balinese inspired bar built of reclaimed oak is open on all sides to accommodate 30 hand-carved teak barstools. Surrounded by a deck of Brazilian Teak, the upper level of the space is filled with trees ranging from Buttonwood to Bromeliad. A variety of seating is available for lounging or conversation, from natural wicker club chairs to upholstered ottomans, as well as aged teak sofas and loveseats. 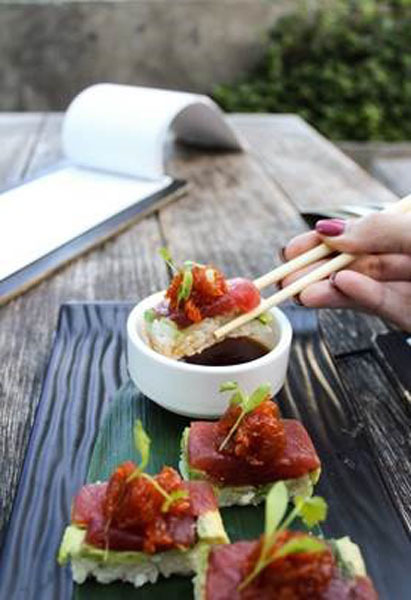 Low-lying tables offer space for Asian tapas to share in an ultra-relaxed, abundantly green space. Sugar is open seven days a week, with seating to accommodate 31 guests at the bar and 78 diners on the lower deck. Sugar is now accepting reservations by phone and you can book a table in advance by calling (786) 805-4655. For more information or to preview special offers and happenings at Sugar, visit http://www.east-miami.com/en/restaurants-and-bars/sugar. Swire Hotels has been created to manage soulfully individual hotels in Hong Kong, Mainland China and the USA, providing a characterful experience for well traveled individually minded travellers who seek originality, style and personalised service. We create distinctive hotels with a sense of place that break with convention. The company’s first hotel, The Opposite House in Beijing, opened in 2008 and was followed by The Upper House, Hong Kong, and then by EAST, Hong Kong, EAST, Beijing, The Temple House, Chengdu and EAST, Miami. The Middle House in Shanghai is scheduled to open in end of 2017. EAST, Miami is Swire Hotels’ first venture into North America, following the openings of EAST in Hong Kong and Beijing. Created for unconventional travelers looking for a fun and relaxing place to stay, EAST, Miami offers distinctive experiences for those seeking innovation, style, and personalized service. EAST, Miami offers 352 guest rooms to include eight suites and 89 one, two and three-bedroom residence suites (fully equipped apartments with kitchen, laundry facilities and full access to the amenities and services of the hotel). Guests can expect keyless entry, paperless check-in and check-out, a native App with locally curated insights and travel tips, art exhibits, health and wellness programing and array of other happenings to make them feel totally at EAST. The hotel boasts its signature restaurant Quinto La Huella; a poolside bar & lounge and a rooftop destination bar called Sugar; 20,000 square-feet of meeting and banquet rooms with bay and city views; a 20,000 square-foot outdoor pool and deck (with four different pools) which can be used for private events; a lobby café and bar, Domain, and a 24-hour fitness center. Located at 788 Brickell Plaza, Miami, Florida 33131, the hotel is centrally located within a 15-minute drive from the Miami International Airport, and situated on top of Brickell City Centre – conveniently connected to popular districts such as Wynwood, the Design District, and South Beach. For reservations please email reservations@east-miami.com or call 305-712-7000. For more information, please visit http://www.east-miami.com/.